Since their introduction, the new Foxy Hybrids have been a sensation. Unlike most biennial digitalis; plants in the Foxy Group are noted for their ability to produce flowers in the first year, flowering in just five months from an early sowing. 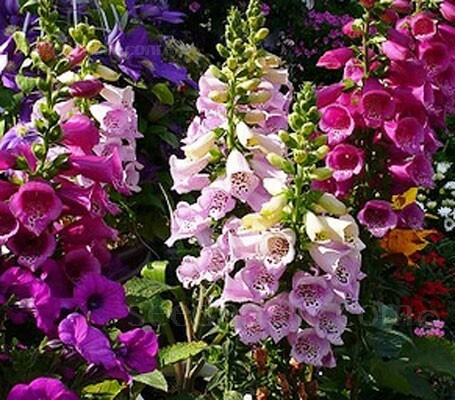 They can be planted in autumn for an early showing or eight weeks before frost to get late-summer blooms and although they are often seen advertised as an “annual” foxglove, they will also give a repeat showing in the second year. This very useful dwarf variety can start blooming at a mere 45cm (18in) tall, and grow on to a metre (3ft) in height. They will bear up to nine dense spikes per plant with flowers in a mix of purple, rose, lavender, red, cream, yellow and white, each with distinctly speckled throats. The large 7 to 8cm (3in) tubular flowers are fuller and are borne all the way around the stem and are held horizontally, they display the heavily spotted throat markings to better advantage. This useful dwarf variety is invaluable for exposed sites and, as with other foxgloves, they are especially good for shaded areas. 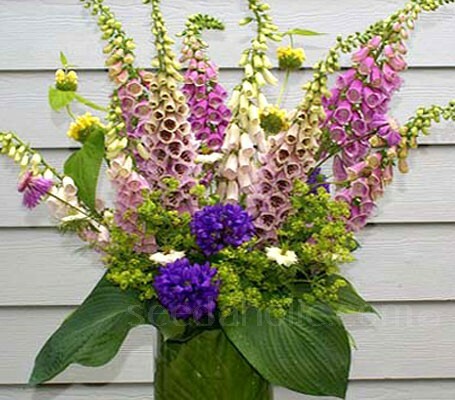 Colourful, prolific, and long-blooming, the flowers are very useful for cutting. Sowing: Sow indoors in early spring or directly outdoors in autumn. Because they require a growing season of five or more months to fully complete their blooming, seedlings of `Foxy' should be started in early winter and maintained in a greenhouse until spring transplanting. Sow in Jan to March, at least 8 weeks before last frost. Sow seed thinly in trays of compost and place in a cold frame or greenhouse. Once germination occurs keep in cooler conditions. Prick out each seedling as it becomes large enough to handle, transplant into 7.5cm (3in) pots or trays to grow on. Gradually acclimatise to outdoor conditions for 10 to 15 days before planting out once all risk of frost has gone. Transplant to the flowering position planting 30cm (12in) apart. Sow in late summer to autumn directly in a well prepared bed. Sow seed thinly in drills 30cm (12in) apart. Firm down gently. Keep the plants moist and free of weeds. Thin out seedlings to 15cm (6in) apart when large enough to handle. 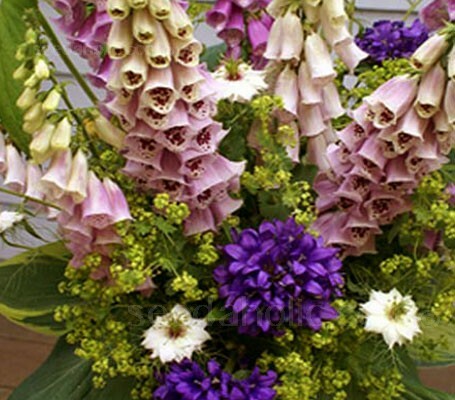 In order to get a `Foxy' foxglove to survive a second season is best if you remove the flower stalks immediately upon completion of the first season's flowering. This will halt the movement of energy toward seed production, and focus energy where it will promote winter survival. Mulching will also be beneficial. You can reseed from the second showing. Self-sown seedlings producing different shifting, untutored patterns of flowers each year, they can be easily transplanted to the location you want them to bloom. They are best transplanted when the leaves are about 10cm long. Make sure the newly moved plants are well watered to help them establish. or directly outdoors in autumn for flowers the folowing year. 2 to 4 weeks at around 20°C (68°F).